Another week without any posts. This is becoming embarassing. And, as is usual when this happens, there isn’t anything particularly worth waiting for. This had potential but I can’t quite remember what that potential was since it was so long ago that we ate it. There was chilli, garlic and anchovies in here, along with some mushrooms and some cavolo nero. And that odd looking pasta that, while tasty, was impossible to eat. 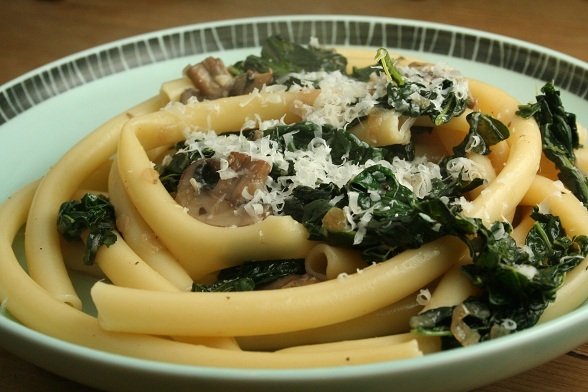 This is our second attempt at using cavolo nero in a pasta dish and it was much better than last time. I think I just need to stop trying to be healthy and throw a load of salami and mozarella at it. And write it up more quickly so I can remember what I did and what I need to do next time. Subscribe to comments with RSS	or TrackBack to 'Cavolo Nero Pasta'. I love cavalo nero – such a deep, iron flavour to it. I just wish it was available more widely. .-= Lizzie´s last blog ..Alain Ducasse at The Dorchester =-. Me too, Lizzie. I’ve seen it at Waitrose a lot this year but have had trouble finding it elsewhere. You’re right about that pasta. I think it’s best for lining a timpanum, a la Big Night. Is timpanum the pasta pie dish, Alex? I can see how it would work well in that.